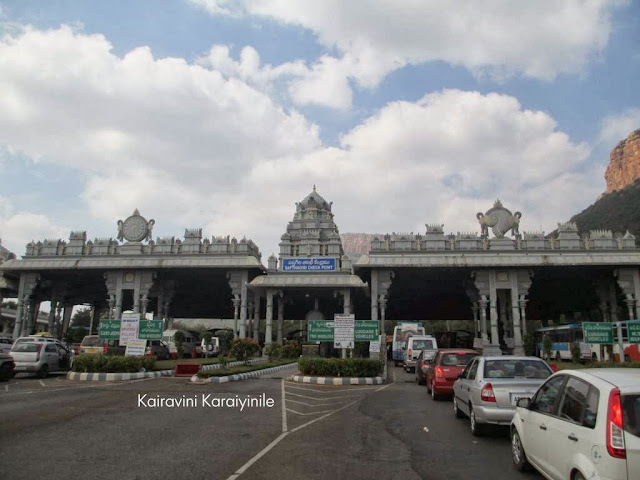 For Sri Vaishnavaites, the word Kovil, Thirumalai, Perumal Kovil would refer to “Sri Rangam, Thirumala Tirupathi and Kanchipuram” respectively. The sacred and most reverred temple of Sri Venkateswara is located on the seventh peak – Venkatachala hill of Tirumala. The Lord stands tall as bestower of all boons and lakhs of people reach here to have a glimpse – a few seconds darshan of the Lord. This beautiful temple in its present form owes a lot to the works of the greatest Vaishnava Acharya – Sri Ramanujar. The very thought of Tirumala and chanting the name of Lord of Seven Hills would cleanse our souls. 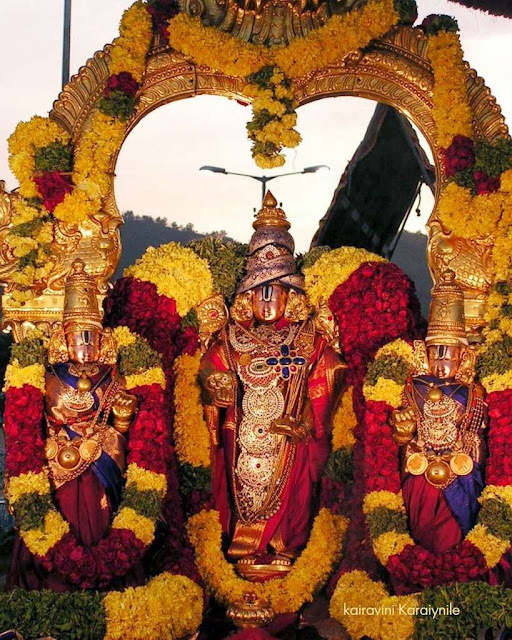 Thirumangai Mannan exalts the Lord of Tirumala as the One – who embodies all the five elements of nature; one who is praised by thousands of names; the One who is not bound by earthly birth ‘ the blemishless Lord who stands at a place where the railwater and dew combine as dark clouds to shower ensuring abundance of fruit bearing trees ~ the most beautiful paradise situate on hills known as holy Tirumala …..
Thirumala has existed for Centuries and Lord Venkateshwara will provide all riches, all wealth and all goodness to all His believers. Thiruvengadam, the abode of Lord Balaji is the ‘Thilakam’ the shining glory of the whole Earth. All that we need to do is to pray towards the Greatest Lord of Universe from wherever we are, think of HIM always and do good to humanity in Thy Name. Lakhs of devotees of all ages, from all over the Country and from other parts of the World throng to the hills, by walk, by vehicles of various hues and wait in the queue for hours to have a glimpse of the Lord. There will seldom be a day in Thirumala when crowds are lean – it is getting more and more crowdy. To his bakthas, a few minutes of darshan is worthy as they undergo all ordeals, often having to stand in the Queue for long hours. Many undertake hardships to fulfill their vows, and at every single crisis, they pray to Lord Balaji to bestow His kindness upon them and set upon pilgrimmage at every possible opportunity. 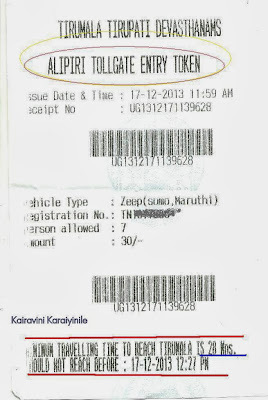 Tuesday 17th of Dec 2013 provided me another opportunity of having darshan at the holy Tirumala. 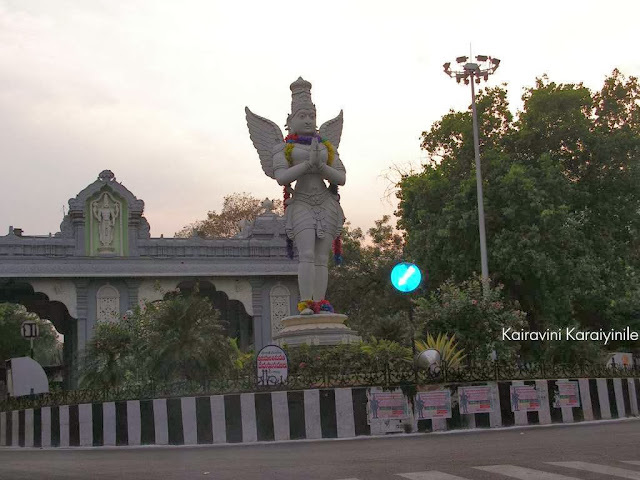 For us the very sighting of huge Garuda at the entrance of Alipiri mettu – the originating point of the Holy Hills where people start ascending the 11 kilometer stretch raises the spiritual happiness. For ages there was only one route – now we are fortunate enough to have two routes – one for ascending and the other used for descending…….. and to think that our Acharyar Sri Ramanujar ascended the hills crawling on all fours unwilling to tread upon the holy body of Adisesha instills awful reverence to the place. You would have driven your own (new) vehicle on the hill route to reach Tirumala and have darshan and sure would have overtaken slower moving vehicles……… this time – saw Audi, Mercedes, Volkswagon, Innovas, Jeeps, Scorpios and many more ….. not speeding but seemingly going slow on the route….. if you wonder how could all the drivers suddenly become so self-disciplined….. it is all due to the time-bound traffic management plan put in place on the Tirumala ghat roads. Now one can cite boards cautioning that ‘Minimum time for ascending ’ by 4 wheelers is 28 minutes and similarly for descending from Ghat point till Alipiri it is ’40 minutes’………. It is the Minimum Time - it is 40 minutes on the exit route to reduce the speed of journey because there are 56 deep curves in the road. 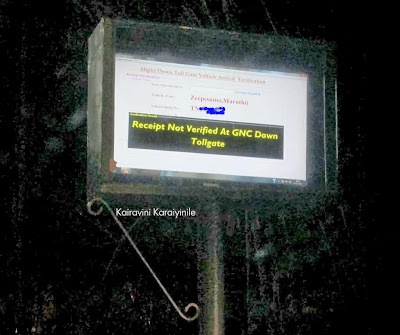 Ever since implementation of the rule, the compliance of travel time is being strictly monitored by the Vigilance and Security wing sleuths. 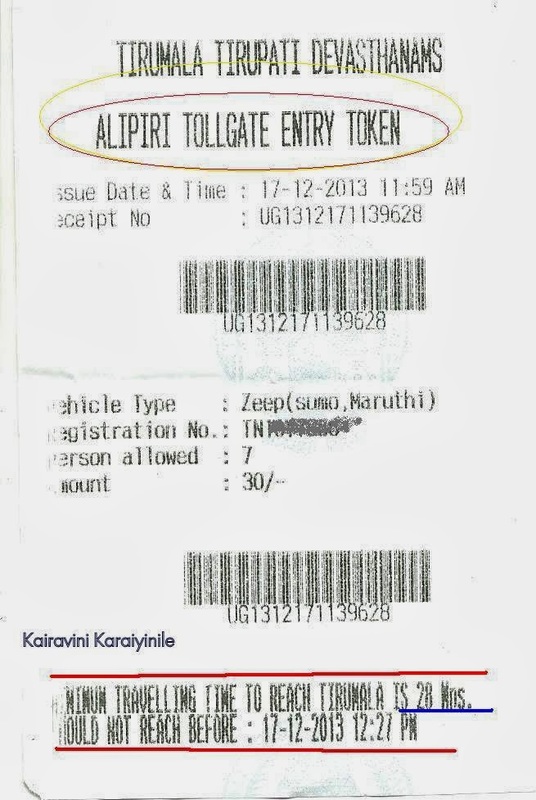 The authorities claim that they are imposing penalties on those drivers who violate the time limit and come early………… some motorists could be seen stopping at intermediary places to ensure that they do not turn up before the time………..
Adiyen got an opportunity to visit Tirimalai on 30th Nov and !st December. I too saw not only speeding vehicles but also drivers constantly on mobile phones. That also can cause accidents. To ensure the drivers do not speed up, the timings may be captured at three/four points that will ensure the drivers not speeding up and halting to beat the minimum time. The temple is truly divine and you captured the true spirit of the place.